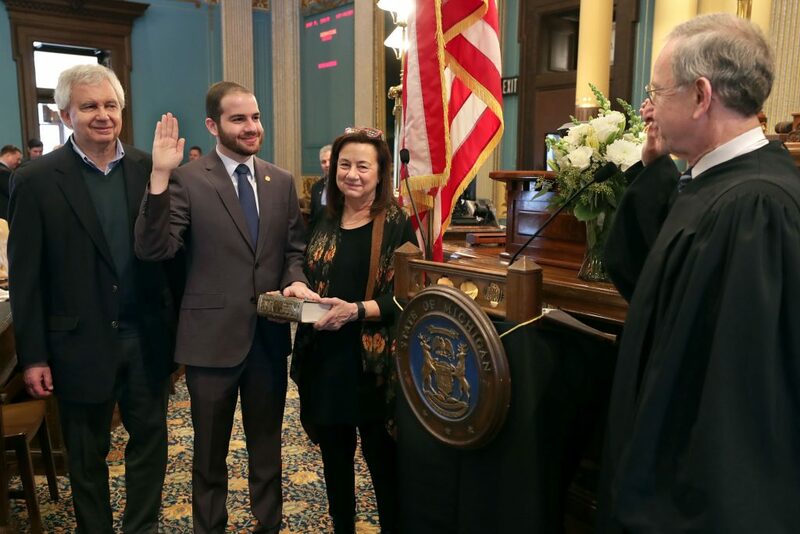 LANSING, Mich. — Sen. Jeremy Moss (D–Southfield) took the oath of office today to represent the citizens of Michigan’s 11th Senate District in southern Oakland County. Sen. Moss begins his first term in the Michigan Senate with his Chief of Staff Sarah Schillio, Legislative Director Jason Hoskins and Legislative Assistant & Scheduler Carter Zielinski. Sarah Schillio previously served in the Michigan House as Floor Operations Manager and Legislative Director for former Minority Floor Leader Christine Greig and Legislative Director for former Minority Floor Leader Sam Singh. She also worked as Legislative Assistant to both Reps. Jeff Irwin and Lee Gonzales. Sarah is a Michigan State University alumna and lives in Lansing with her husband and two children. Jason Hoskins served as then-Rep. Moss’ Legislative Director in the Michigan House of Representatives and as his Campaign Manager for his successful House race. A resident of the district, he earned his bachelor’s and master’s degrees from Eastern Michigan University and his law degree from the University of Detroit Mercy School of Law. Carter Zielinski previously interned in then-Rep. Moss’ office, and also completed internships with Congresswoman Brenda Lawrence and now House Speaker Nancy Pelosi. Most recently he was Sen. Moss’ Campaign Manager for his bid for the Senate. Carter is currently a senior at Michigan State University and will graduate in May. The 11th District in Oakland County consists of Farmington, Farmington Hills, Ferndale, Hazel Park, Huntington Woods, Lathrup Village, Madison Heights, Oak Park, Pleasant Ridge City, Royal Oak Township and Southfield.